First time renterssubmitted by Tisha A. - Mar 23, 2017 |Recommended: YesVery pleasant place to live, a few problems with our toilet and refrigerator, but maintance is very helpful and everything was fixed within the same day. The ladies in the office are extremely sweet and have helped us along the way, very patient knowing we are first time renters. I feel safe and I'm glad to call it home . Feels like a Vacation Homesubmitted by McQuel D. - Jan 30, 2017 |Recommended: YesIt feels like a vacation home because you're surrounded by a great amount of tree's and nature. Completely cut off from the open streets -- minus the freeway right next to you. There's a long entrance that leads to the apartments lined with trees along the sides. Although guest parking could use an improvement, the upkeep around this place is astounding. You see the maintenance people working every single weekday to upkeep everything and make sure it's all clean. Would definitely recommend to friends and family. Great Communitysubmitted by Marina C. - Dec 22, 2016 |Recommended: YesOuter surrounding area outside the complex not so hot. Interesting within the complex it is kept nice and safe. Jessica the onsite manager is wonderful. She's very professional and very sweet. Lots of kids running around and playing within the grounds but other than that everybody keeps to themselves. It's a great community. Great Apartmentsubmitted by Ashley S. - Oct 05, 2015 |Recommended: YesLove this apartment. Very spacious. Every issue I have had has been resolved quickly and efficiently. It is a very great property, would refer family and friends. submitted by Airiona S. - Jul 04, 2015 |Recommended: YesIt is a very quiet and peaceful environment. 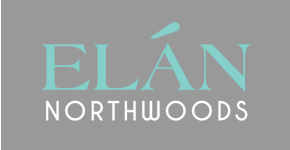 The property manager Jessica is the best and is very helpful I give Elan Northwoods an A .
I think a good on the whole.submitted by Yuji O. - Jan 23, 2015 |Recommended: YesMusic of the upper floors there are times when noisy in the middle of the night. I known not car has stopped well in the parking lot. Heating is noisy. I love the landscaping, and overall cleanliness.submitted by Leyla G. - Apr 24, 2014 |Recommended: YesI enjoy it very much. Clean, forest like, safety. A+ on pet friendliness. Friendly staff. Great job! response from property - Feb 06, 2015 Thank you so much for the nice comments we really appreciate it. response from property - Feb 06, 2015 Thank you for your nice review we really appreciate it. Have a great day.